Without a doubt, outdoor grilling has reached an all-time high in popularity. For both the home chef and the professional chef, the health benefits and great taste of grilled foods beat any other type of cooked food. The advent of high end stainless steel commercial grills has certainly helped in this phenomenal growth in grilling. There are dozens of commercial grills on the market, but research has shown that Magikitch'n commercial grills rank up there in quality with the best in the grilling world. They offer a wide selection of grills, in many sizes with many options that promise to take your outdoor grilling experience to new dimensions. 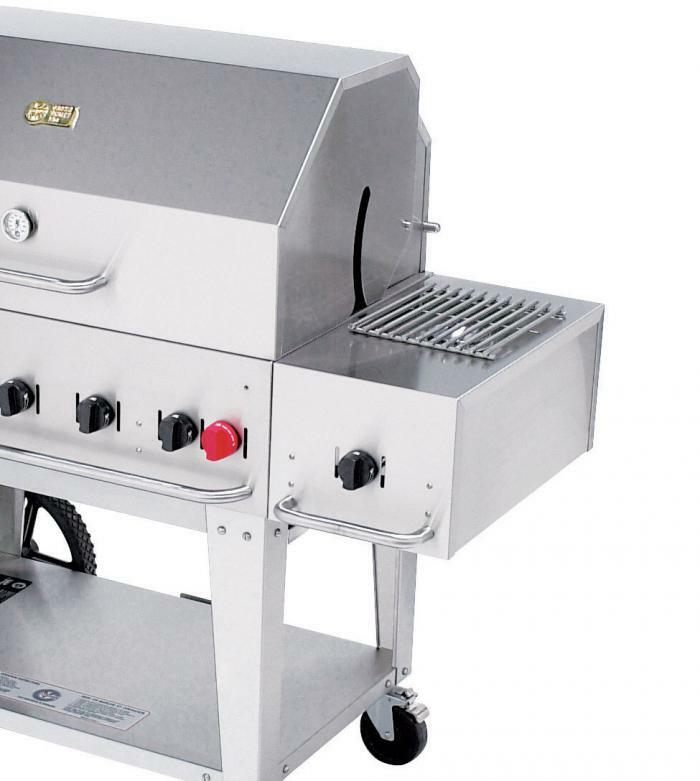 The main features professional grillers are looking for in a commercial grill are the size of the grilling area, the number of burners, the type of gas used, the ignition system, the types of accessories available and ease of cleaning and maintenance. When feeding a hungry crowd, be it at a tournament, football game or country club, you will need a large grilling space. 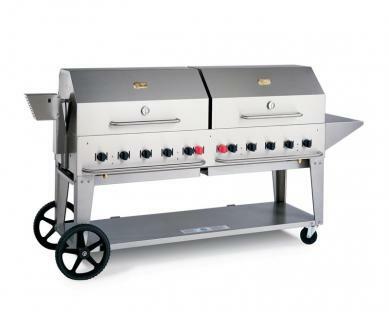 Magikitch'n has many commercial grill models with various grilling surfaces. The smallest model is the which is their 30” model that gives you 600 inches of grilling surface, perfect for the home chef or small grill owner. 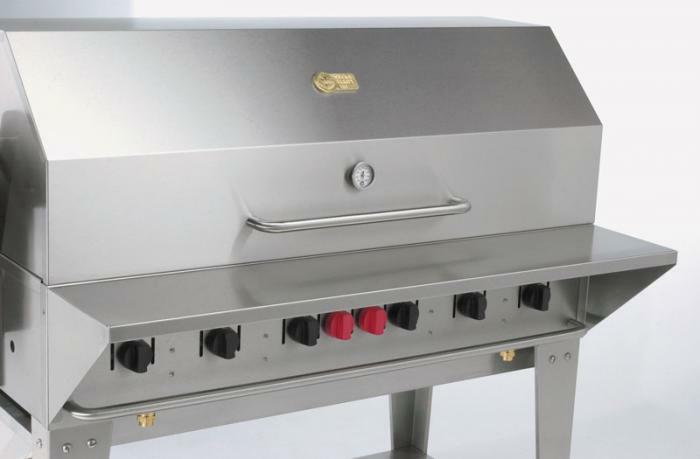 Their largest model, the Crown Verity MCB-72, is their 72” model which gives you more than double the grilling surface found in their smaller models. This is a double grill that can easily feed large crowds at professionally catered events, restaurants and ball games. You will need multiple burners in order to do serious commercial grilling. A good commercial gas grill must have at least four burners, an essential ingredient in two-zone cooking, an important technique used in successful outdoor grilling. A two-zone setup gives you the greatest control over the temperature of the grill. In a two-zone setup, one side of the grill is hot and produces direct radiant heat, while the other side does not produce any heat yet allows the food on that side to cook by indirect convection heat. 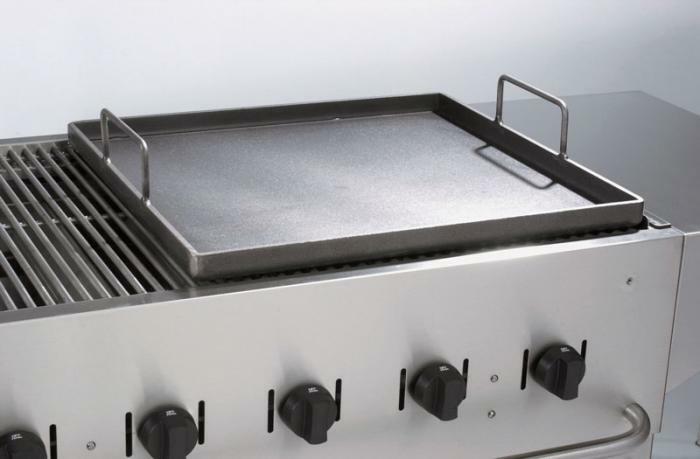 Crown Verity grills are available starting with 4 burners, and can be ordered in models with 5, 6, 8, and 10 burners. The burners are placed side to side, with the controls along the front of the grill. This configuration makes it very easy to control your cooking. With burners lined up from side to side, you can easily employ the two-zone cooking technique. When you turn off one side of the grill you can slow roast over the indirect convection heat, while crisping foods over the direct radiant heat. You can also put meat in indirect heat to keep at holding temperatures. Besides having multiple burners, you will want grill burners that are evenly distributed, individually controlled and fire up quickly and evenly. Crown Verity commercial grills have a minimum of 150,000 BTU per burner and the burners are placed every 5.75” to ensure even heat distribution. With the lid down, Crown Verity gas grills will reach cooking temperatures of 500 degrees in 6 minutes and temperatures of up to 800 degrees in just in 10 minutes. The hotter the grill gets, the more control you have over the temperature and that gives you greater cooking flexibility and precision. Also important to know is that burners that are made from quality stainless steel that will last for years. 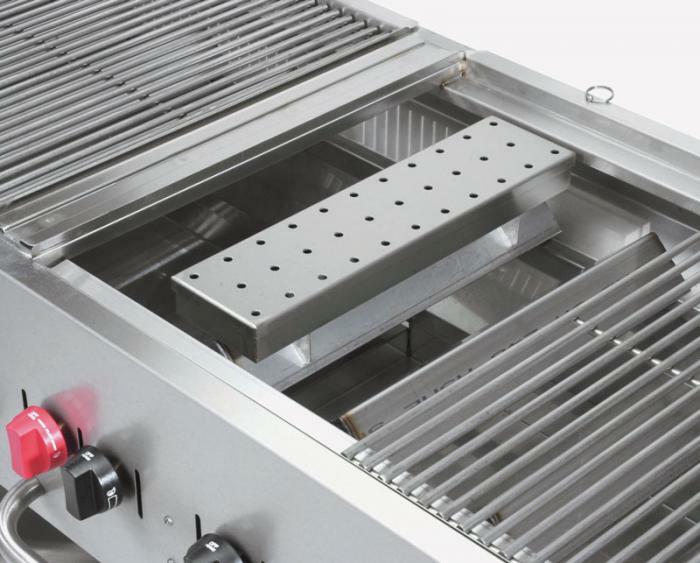 Crown Verity burners, cooking grids and fasteners are all made of 304 stainless steel and the cooking grids and burners both come with a 10 year warranty. 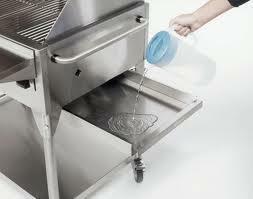 They are also easy to clean and maintain, which will add years of use to your grill. Most experts agree that you will need a cover for effective outdoor commercial grilling. Covers, while sometimes an option or accessory, are quite important and not purchasing one can really limit the type of cooking options available to you. While cooking without a cover is certainly fine for burgers, hot dogs and performance grilling, by using a cover you will be able to set up for two-zone cooking and cook thick steaks, ribs, turkey, chicken, salmon, veggies and much more. Crown Verity commercial grills are all sold with an optional, easy to install roll dome. You will want to order this roll dome, along with your high performance grill, to achieve the widest range of cooking possibilities. There are two types of gas options available on the grilling circuit, one being liquid propane (LP) gas and the other being natural gas (NG). Liquid propane gas comes in 20 pound steel tanks. If you have an LP grill you will need to have backup tanks on hand for those times when you run out of gas in the middle of cooking. 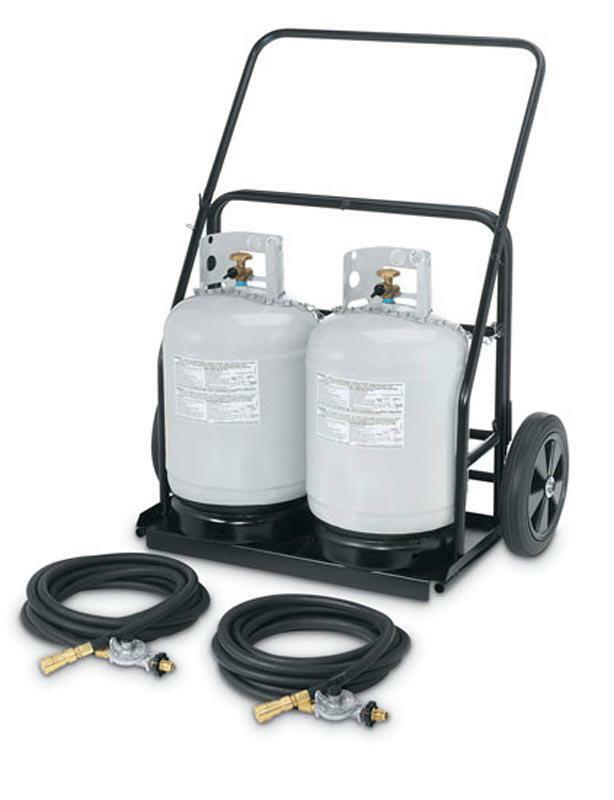 Liquid Propane gas is the best choice for grilling because, when pressurized, it compresses and turns to liquid, making it easy to store in tanks. 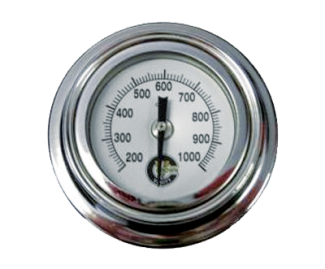 Propane gas barbecues heat up quickly and provides a high level of BTUs for cooking. A BTU (BritishThermal Unit) is the amount of energy required to raise the temperature of one pound of water 1°F. There are about 2,500 BTU in one cubic foot of propane and only about 1,000 BTU in one cubic foot of natural gas. The natural gas delivered to homes and commercial restaurants is comprised mostly of methane. This type of gas is delivered to the grill by a pipeline that extends from your food establishment to the grill by a certified gas contractor. Because an NG line is a hard line, your grill will not be able to roll around. Natural gas barbecues heat up quickly and also have high levels of BTUs for cooking, as does propane gas. An advantage of natural gas is that it is readily available and you will never run out, assuming that you pay your gas bills. Other advantages of NG over LP are that it is about 20% the price of LP; it is more efficient in the winter because it comes in a gaseous state; and, you don't have to buy refills in the last minute. All Crown Verity commercial grills are available in both LP and NG models. 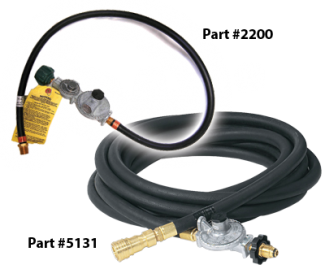 Also available are conversion kits from propane to natural gas, and natural gas to propane gas that can be purchased separately. This would enable you to convert the gas type used by your Crown Verity commercial grill in a matter of minutes. This is a great and low cost advantage of a Crown Verity grill allowing you to use your commercial grill in settings that demand different gas types. There are two basic ignition systems on standard commercial grills: electronic, which use batteries, or piezo electric ignition, which generates a spark by friction. Both of these ignition systems are prone to breakage and failure. 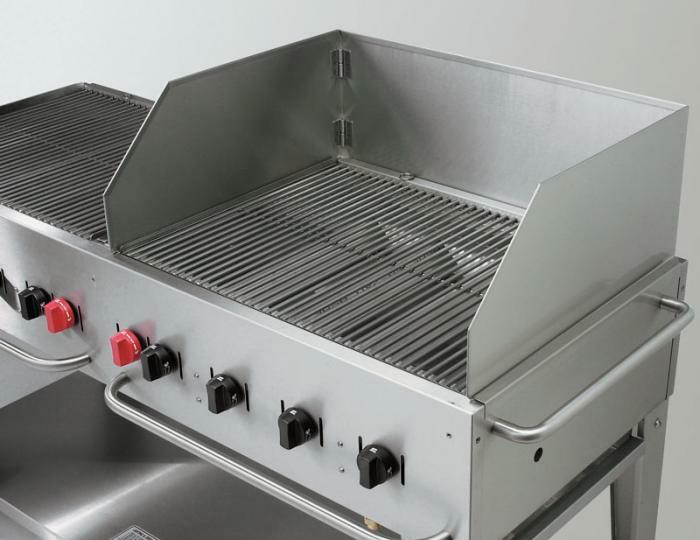 All Crown Verity commercial grills use a third method of igniting and that is via a stainless steel lighter tube. By using a simple utility lighter, the operator can light the pilot by inserting the lighter into a stainless steel pilot burner tube. The stainless steel lighter tube accesses to any pilot and acts as a standing pilot, allowing the operator to turn on and off any burner. This method has proven to be very safe and effective, and has many advantages over the electronic or piezo ignition systems. For outdoor grilling to continue to be the smashing success that it is, outdoor grills must continually upgrade their features. Crown Verity is a leader in offering the most comprehensive accessories on the market. Perhaps due to their long history in the restaurant equipment business, they know what consumers are looking for to enhance their grilling and catering capabilities. 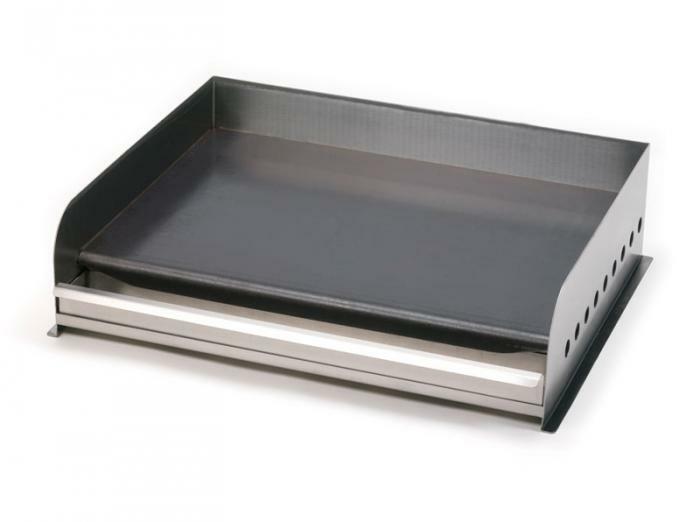 Removable Griddle Shelf and Removable Grill Plate: Perfect for making pancakes, eggs, bacon or any fried food. It can fit on one or both sides of the unit. Steam pan adaptor: allows the unit to be used as a hot food table and holds food at preferred temperatures. Check out more of Crown Verity’s accessories that compliment all their commercial grill models. Towable grills or tailgate grills are a hot ticket item on the outdoor grilling circuit. Towable grills are easily attached to the back of any vehicle and towed to the desired tailgate party location, be a football game, tournament, college campus, or country club event. The most cost effective towable grills not only have a large cooking area and are easily towable, but also feature ample storage space on board for food and drinks. Crown Verity offers three varieties of towable grills. Each type features 6 independent burners with a trailer / hitch that can be easily removed and stored underneath the grill. Some models come with stainless steel insulated containers on board that provide a lot of space for drinks, side dishes and garnishes, and keeps them cold and ready-to-serve. Both the grill and the trailer are made of high quality stainless steel designed to handle the demands of both road travel conditions and outdoor cooking. 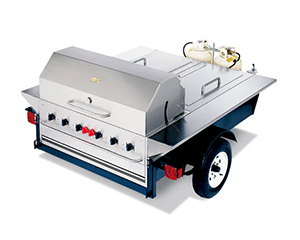 All Crown Verity towable grills can be easily adjusted from tailgate position to level cooking surface in minutes. Crown Verity tailgate grills are a complete outdoor cooking solution and are a big revenue builder for the outdoor griller. 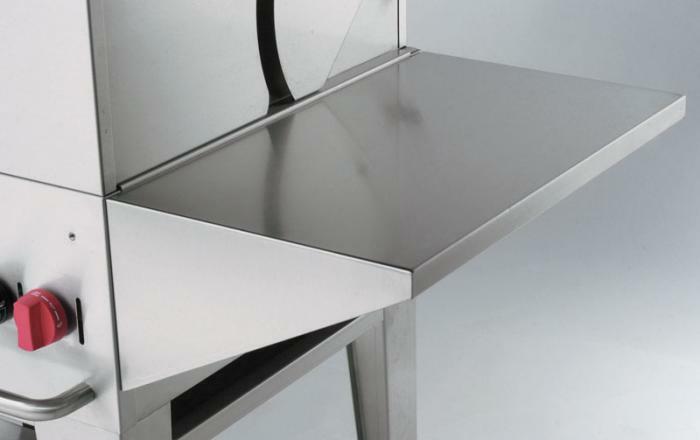 Crown Verity commercial grills are easy to clean and maintain which adds to the long life span of this product. 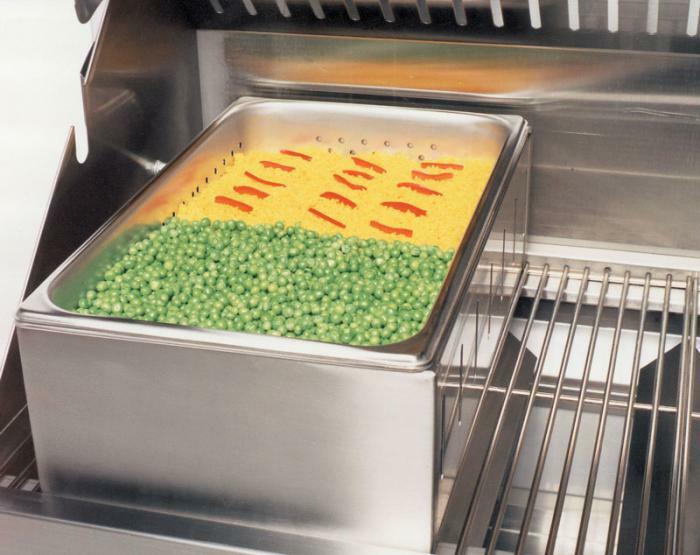 Water pans are incorporated in all grill models. Any fat or grease that drips off the grill will immediately vaporize when it hits the stainless steel radiant and any grease that misses the radiant will then fall into the removable stainless steel water pan. The water pan has a drain port on the end that lets you drain the water out of the pan before removing it from the grill for complete cleaning. 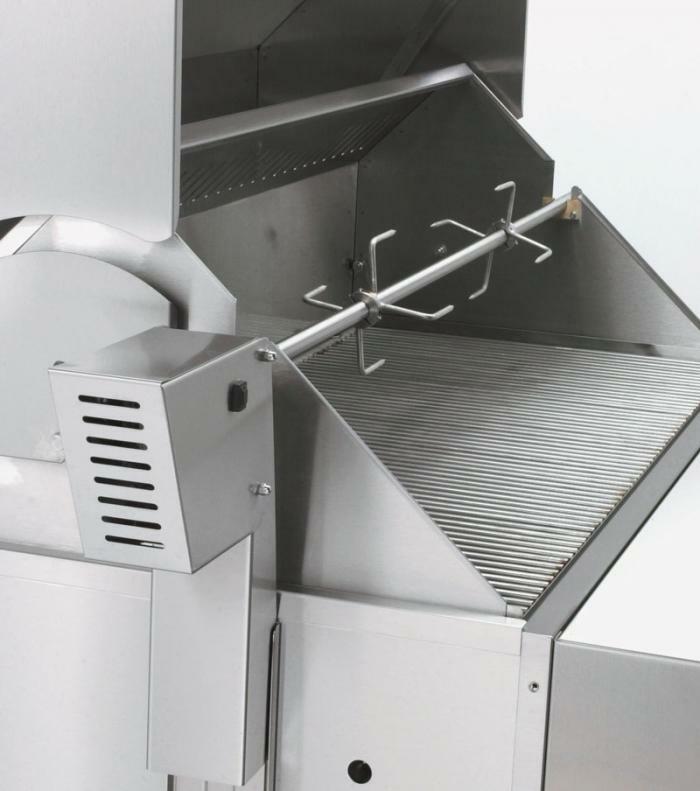 Also, because it is made of high grade commercial stainless steel, the grill can be thoroughly cleaned by covering the pilot with plastic and using a power spray to clean the entire unit. Crown Verity grill roll dome covers come with a built in thermometer that will assist you in accurately measuring the temperature of the cooking surface. 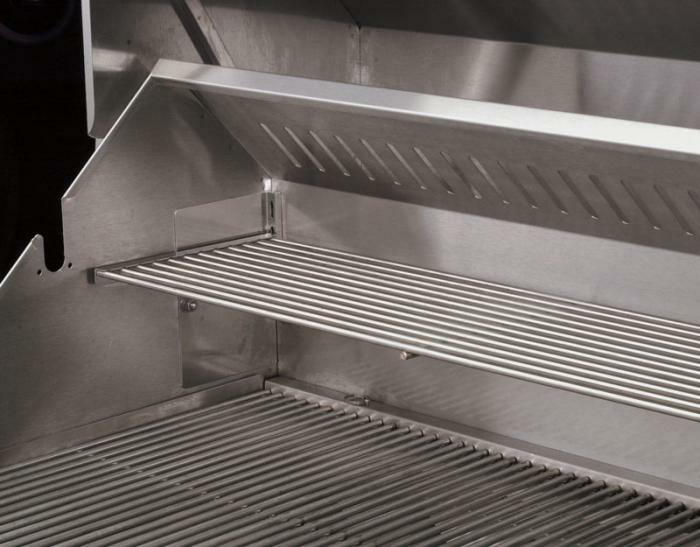 Crown Verity commercial grills ship fully assembled on a wooden grate, no assembly is required. You just need to unload it, hook it to the gas source of your choice, light up and start grilling! Crown Verity grills meet the highest safety requirements in the grill industry and are CGA, CSA, AGA, ETL and NSF listed.